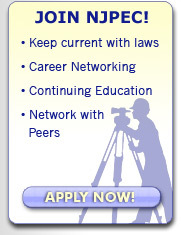 New Jersey Professional Engineers in Construction - College Student Scholarships - Support NJPEC! Once again we ask for your support as a Sustaining Firm of the NJPEC. 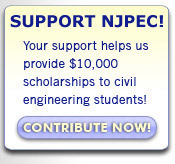 Your generous contributions allow NJPEC to provide technical programs for continuing education in construction engineering and annual scholarships of $10,000 to students pursuing degrees in civil engineering and construction technology. We thank you for helping our organization realize our continuing education and scholarship goals. NJPEC has awarded over $150,000 in construction engineering scholarships since 2000! The NJPEC Sustaining Firm Contribution is $300. You are encouraged to provide additional contributions to the Scholarship Fund. Your contribution with get your name on PEC letterhead and also will be listed in our Sustaining Firms portion of the NJPEC website. Thank You! Additional Scholarship Fund Donations - If you have already made your $300 Sustaining Firm Contribution and wish to make an additional scholarship fund donation, please go directly to this page and choose the second donation button. Note: You do not have to complete the form below a second time.